Stay tuned for ticket links and additional tour announcements. 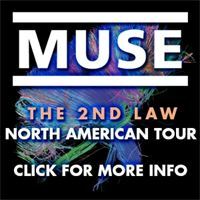 In order to make sure that muse.mu members get the first and fairest access to tickets for these dates, we will have a ticket presale starting Tuesday, December 11th at 10am. To be eligible, you must be a member prior to Monday, December 10th. Please log into your member profile for further details on the presale. VIP packages will also be available: click here. Please note that Paperless Ticketing will be utilized on all floor and premium lower bowl tickets when available. Paperless Ticketing will help eliminate scalping. For select events, Paperless Tickets can be bought and sold exclusively via Ticketmaster's TicketExchange or Flash Seats in non-Ticketmaster markets. Resale prices for tickets can be no more than 20% above face value. Please review all the policies of Paperless Ticketing before completing your purchase: details and a helpful FAQ can be found here. Six more dates have been added to the 2013 North American tour!